The lads from Liverpool have set another record. Their new greatest hits CD is now officially the world's fastest selling album of all time, reports CBS News Correspondent Tom Rivers from London. After breaking up 30 years ago, over 12 million copies of their CD 1 have been sold worldwide over the past three weeks. Beatles spokesman Geoff Baker says Paul, George, and Ringo are surprised, but obviously pleased. "First week sales in the U.S. doubled. It exceeded expectations. In fact the second week was even better. It's madness." Apple, which released the album, said Wednesday the Fab Four's greatest hits album had sold 3.6 million in its first week. That put the British quartet of John Lennon, Paul McCartney, George Harrison and Ringo Starr way ahead of current record holders N Sync, who sold 2.4 million copies of No Strings Attached in its first week of release in March. "Sales are going through the roof and it's not going to stop here," Baker said Wednesday. 1 has soared to number one spot in 28 countries, including Britain, the United States, Germany, Australia, Israel and Chile. 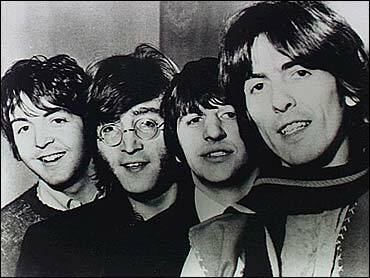 The collection of 27 number one singles from Love Me Do To Long And Winding Road is now on target to become the best-selling album by a group. The Guinness Book of Records said that title is currently held by The Eagles' Greatest Hits, which has sold 26 million copies since its release in 1976. And the hits just keep on coming. Sir Paul is back in the recording studio this week, working on new material. Only three of the Beatles are still alive. Lennon was shot dead by Mark Chapman in December 1980.